Iker Casillas is arguably the greatest goalkeeper to have ever played the round leather game. The living legend currently plays for Portuguese giants FC Porto but will always be best known for his incredible time with Spanish and European big gun Real Madrid, where he spent most of his playing time standing in between the sticks for the 13 times European champions. He was also the captain of the impressive Spanish national team that dominated both Europe and the World a couple of years back. Iker Casillas Fernández was born on May 20, 1981, in Móstolea, Madrid, Spain. His father, José Luis Casillas worked in the Ministry of Education while his mother, María del Carmen Fernández González was a hairdresser. When Casillas was 9, his dad took him to an open trial at Real Madrid. The coaches at the trial were impressed with Casillas goalkeeping skills and accepted him. He then joined Real Madrid’s youth system, LA Fábrica and was trained by Vicente del Bosque. He spent 9 years at Real Madrid youth team, playing in Real Madrid C and with Real Madrid Castilla, the club’s B team. When Casillas was 16, he was called up to the first team, for a UEFA Champions League game against Rosenberg on November 27, 1997, but was rooted to the bench throughout the match. However, in the 1990-2000 season, he made his senior debut for Real Madrid when he started a La Liga feature against Athletic Club Bilbao at the San Mamés, on September 12, 1999. He made his UEFA Champions League debut three days later when Real Madrid took on Olympiakos. He also became the youngest goalkeeper ever to feature in a UEFA Champions League game, he was 18 years and 177days old. The record has since been broken by Mile Svilar. In the final of the UEFA Champions League match against Valencia in 2000, Casillas was in goal for Real Madrid as its season’s first choice goalkeeper César Sánchez was out injured. Real Madrid edged out Valencia 3-0 and it earned Casillas his first silverware with the club and also made him the youngest ever goalkeeper to have played and won a UEFA Champions League final match, after just turning 19. Casillas has since gone on to win Europe’spremier club competition in 2002 and was the captain of the Real Madrid team that won the La Decima in 2014. He was named as Real Madrid’s captain at the start of the 2010-2011 season, following the departure of the club’s first choice captain, Raúl González and second choice captain, Guti. He went on to remain the club’s captain until his departure in 2015. Early in 2013, the shot-stopper got injured and Madrid’s manager at the time. José Mourinho was quick to replace him with new signing Diego López. Casillas then made his first start against Galatasaray in a Champions League match after several months on the bench. Real Madrid new manager, Carlo Ancelotti then decided to make Casillas his first choice goalkeeper in the UEFA Champions League and Diego López maintained his number one spot in La Liga. 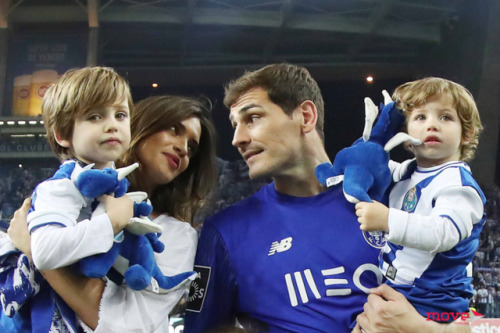 After guiding Los Blancos to several domestic, continental and international titles, Casillas chose to leave the Spanish club after a couple of controversial seasons. He signed with Portuguese big name FC Porto on July 11, 2015, and have remained with Porto till date. Casillas made his senior national team debut at 19 years and 14 days, against Sweden, on June 3, 2000. He became Spain’s first-choice goalkeeper at the 2002 Korea/Japan FIFA World Cup, following an injury to the then Valencia goalie, Santiago Cañizares. And after the 2002 World Cup, he secured his spot as Spain’s number one man between the sticks going into several tournaments. Casillas became his national team’s captain following Raul’s omission from Spain’s squad for Euro 2008 in Poland & Switzerland. He guided the team to the nation’s first major trophy when it defeated Germany by a goal to nil in the final of the tournament. In the same year, his fantastic saves and impressive run earned him the fourth spot in the 2008 Balloon d’or. He was also named as the best goalkeeper by IFFHS. In 2010, he became the third goalkeeper to captain the winners of the World Cup and also won the World Cup Golden Glove as the best goalkeeper at the 2010 World Cup in South Africa. He once again captained the Spanish national team as they conquered Europe for a second consecutive time after they defeated Italy in the final of Euro 2012. In the process, Casillas conceded only once in the entire tournament. The footballer has certainly seen good times in his career and is still seeing though in another league as he seems to be gradually winding down his goaltending career. Currently, Iker Casillas earns a €7.5million annual salary at FC Porto. His Net worth is $40 million. Iker Casillas is married to Spanish sports journalist, Sara Carbonero. Sara was born on February 3, 1984, in Corral de Almaguer, Spain. She and the goalkeeper first met in South Africa, during the 2009 Confederations Cup which Spain lost in the final to a Neymar inspired Brazil. They started dating in that same year and got married on March 20, 2016, in Boadilla del Monte, Madrid. The couple has two kids together, Martín and Lucas. His family thus include his wife and two sons. Casillas also has a brother who he is 7 years older than. His name is Unai Casillas. Unai is also a footballer and has played for several Spanish lower division clubs. Standing at 6 feet, 1 inch (1.85m) in height, the FC Porto keeper weighs 84kg which equals 185.1lbs. Casillas is the most capped player in the Spain national team. He holds the record of the most clean sheet in the UEFA Champions League. The highest number of appearances in the UEFA Champions League. First goalkeeper-captain to lift the UEFA European Championship. He has won all major trophies for both club and country. The goalie has over 1,000 professional caps, the second most capped European player of all time and Real Madrid’s second most capped player. He holds the highest appearance by a goalkeeper in the FIFpro world XI. Iker came fourth in the 2008 Ballon d’or. He is the first player to play in 20 UEFA Champions League campaigns.